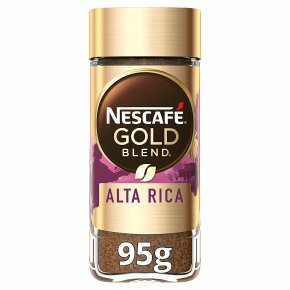 Stir your senses with NESCAFÉ GOLD ORIGINS Alta Rica instant coffee. A premium deliciously dark roast instant coffee for an intense experience. Crafted with 100% Arabica coffee beans from Latin America. An intense taste with a surprising cacao finish. Grown respectfully; sustainably sourced & selected by local farmers. Delight your senses with NESCAFÉ GOLD ORIGINS Alta Rica. This premium instant coffee is made using dark-roasted, pure Arabica beans from Latin America for a delicious coffee with a distinctive, intense flavour. A bold drinking experience with a surprisingly smooth cacao finish.